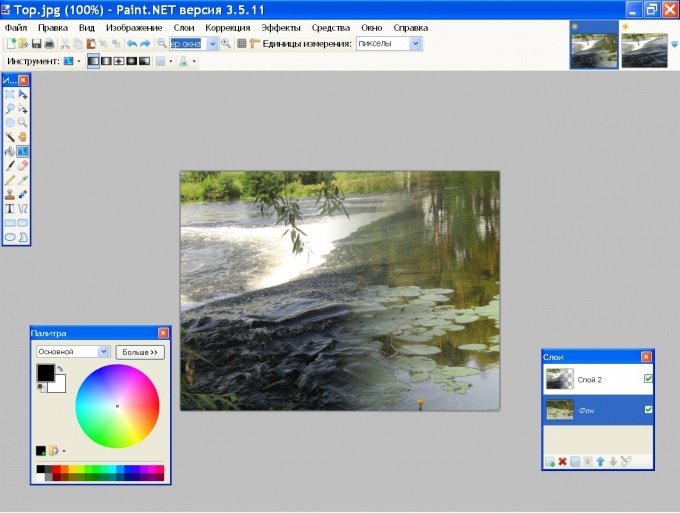 Raster graphics editor Paint was initially created as a training project several American students. Today, two of them work at Microsoft, and the Paint application is distributed with every distro of Windows operating system. 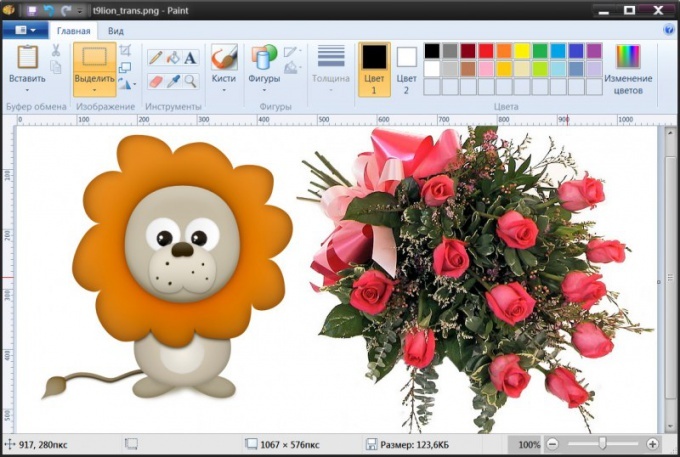 The possibilities of this medium is quite sufficient for many common tasks in graphics processing, including combining two initial photobooks into one. - computer with Windows operating system. Launch Paint and load the main photo. These operations can be combined, if you click the thumbnail pictures in a Windows Explorer or on the desktop, right-click, go to the context menu in the section "Open with" and choose the line Paint. If you have already downloaded the image editor via the menu "start", then to call the dialog opening the desired file is convenient to use the keyboard shortcut Ctrl + O. the Main consider the photograph that should be on the right or top in the final image. Add additional space in the main pictures, to place it upon the second photo. To make it easier by moving nodal points - they are placed on the right and bottom borders of the image and in the lower right corner. Move them by holding the left mouse button. Increase the width or height (depending on where you want to place the second photo) with the stock. After the procedure, the extra space can be removed the same way. Load the second photo. 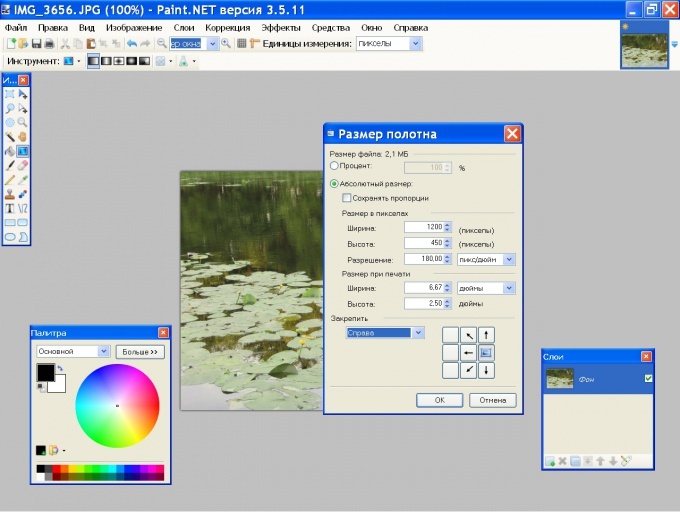 To do this, open the drop-down list "Insert" tab on the "Main" menu in Paint and select "Paste from". In the dialog that opens, browse to and select the file, and then click Open. Paint will put the second photo over the first and turn on the editing mode. Move the second picture to the desired location and set it to the correct dimensions. Moving is highlighted by a dotted frame the image by dragging it with the left mouse button, and the resize is not difficult with nodal points - in this case eight, four at each corner and in the middle of each side. Turn off the mode of editing the second photo, clicking the mouse outside the selected area, and finally adjust the size of the combined image. Then save the result to a file - save dialog you can call, opening the application menu by clicking the blue button and selecting "Save as". 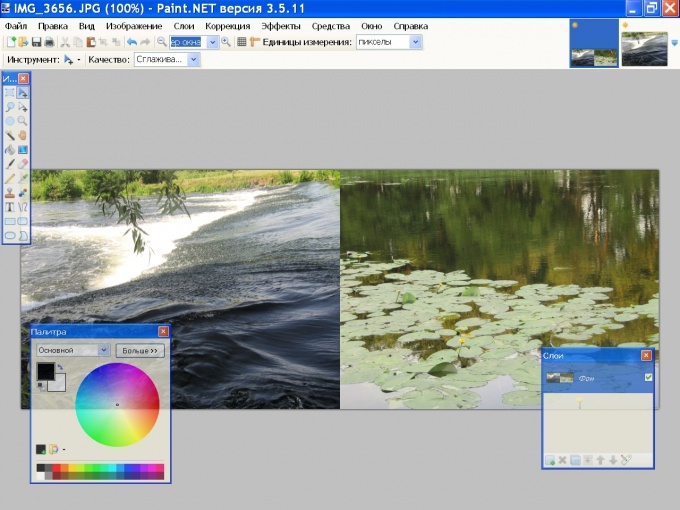 By free graphics editor Paint.net you can create different collages of ready-made images. The boundary between pictures in this case may be clear or blurred. Open the first photograph with the command "Open" from the menu "File" and specify the path to the desired file. If the picture is very large, you can change the size as appropriate to create the collage. In the menu "Image" select "resize" and select the desired values in the "Width" and "Height". To avoid distortion, select the checkbox for the option "Maintain aspect ratio". Open the second picture and change its dimensions in the same way. If you want to place photos side by side in the horizontal plane, it is desirable that their values at the height of the same. In the menu "File" click "Select all" then "Copy". To place two photos side by side, you need to increase the canvas size of the first image. Switch to the first photo, go to menu "Image" and click "canvas Size". Width must be equal to the total width of both photos. Ctrl+V paste on the empty space next to the first image of the second photo. If necessary, adjust its size using the control handles sizes on the sides and in the corners of the picture. You can make a smooth transition from one picture to another. To do this, place the image on 2 layers, one above the other. On the toolbar, click the "Gradient". In the properties pane, specify the linear type. From the list "Color" and "Transparency", select "Transparency". 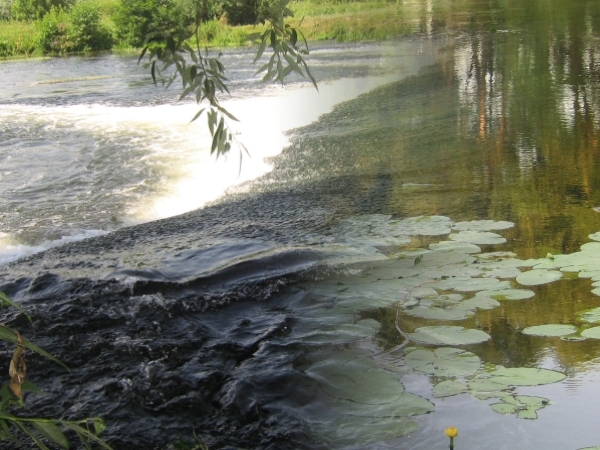 Activate the top layer and draw a horizontal line in the photograph.